Welcome to the dedicated Bar X website www.bar-x.com a site for enthusiasts, players and fans alike. The site has been set up thanks to player demand asking for a centralised resource to find links to websites, arcades, bingo halls and casinos where the famous Bar-X or OXO slots can be found. The Bar-X is the UK’s most popular Amusement With Prizes (AWP) / Slot machine or more affectionately known as – Fruit machine or “Fruity” spanning over 30 years and more than 100,000 units built to date – thats an average of 10 BAR X Machines for each Arcade and Bingo Hall in the country! The Bar X is known as “OXO” and through many guises such as Super Bar-X, Bar-X Deluxe, Bonus OXO, BAR X Bonus, Bar X Gold, Bar X Magic 10, BARX5, BARX7, BARX10, BARX25 and Diamond BAR X to name a few and has been in constant production since 1981. The BAR X, was a concept machine designed and manufactured by Electrocoin Ltd and whose symbols and look has been sub licensed to many other companies within the gaming industry due to its famous and well trusted and recognised brand, sounds, symbols and design. It started off as a traditional “one armed bandit” but over the years added features such as holds, nudges and electronic spins. Here is an original OXO machine, one of the first machines off the production line and still in use today over 30 years later! Many years ago, in the late 1970′s many machines came and went, but the popularity of the AWP / Fruit machine was hitting an all time high and Electrocoin (Website: www.electrocoin.net) felt that the market was missing something, so decided to give their idea a go. The founder of the company, John, decided that most fruit machines at the time were too complicated to understand for most players so drawing a Bar, an X and a ZERO symbol on paper and covered the reels of an electro mechanical machine. Eventually having worked out the combinations to ensure it was a viable and fair machine, although there was still no real name to this machine. It was known initially as an ‘OXO’ machine. The machine was being tested in a few central London arcades and with some positive reviews from players and managers alike Electrocoin decided to the time was right for a production run and to bring the product to market. Despite numerous push backs from other manufacturers, eventually, Electrocoin decided that the only option was to market and produce the machine themselves thus the start of Electrocoin becoming one of the UK’s largest manufacturer of Fruit Machines. History was made when the first prototype units machines were brought in from Japan, and full production ensued after the whole line sold out within weeks. Players were ignoring other machines and flocking in queues to play a Bar X. 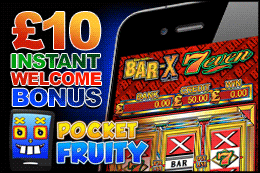 With its multiple features, random elements of chance and the famous hidden features and tricks, popularity of the Bar X continued to grow and player demand ensured that bingo halls, arcades, seaside entertainment centres, pubs, bars and even nightclubs were installing their own Bar X. As many people reading this will recall, most arcades had rows of Bar X machines on the floor. Later followed the Big 7′s, Red Bars and other variations of the same game and simple concept. During the token days the Bar X machine built a HUGE customer base as the players enjoyed a random game style and a very enjoyable game for their money. There are still many arcades with wall to wall BAR Xs fruit machines. Due to Popular demand Electrocoin marketed the BAR X across the world – The USA to Australia and Brazil and within Europe the brand and symbols became synonymous with Fruit machines. Most recently Norway, Spain, Greece, Sweden, Cyprus have all received BAR X Machines. Many other versions were made throughout the Jackpot increases and are still being made today in both Retro Cabinets and in all new signing and dancing shiny metal cabinets with HD Video screens. The Bar X has since been licensed onto other formats and games such as pusher/penny falls machines, and even was licensed into toys and given as gifts to over 20,000 Bingo members as a “for fun” money box with ringing bells and the famous Bar X and O Symbols. Most recently licenses have included online games accessible via all the major UK gaming sites and Mobile phones such as Playtech, Gtechg2, Gausellman, Novomatic, IGT, PocketFruity and William Hill. This site contains photos, videos and general information about where to play the BAR X both offline and online and we hope you join us by uploading your own photos/videos and stories and don’t forget to “Like” us on Facebook and follow our twitter and youtube feeds, all comments and feedback are welcome. This is your site – for Bar X lovers around the world!